Within the Symbaroum Core Book you have enough background within the first 70-pages or so to get you up and running, with particular focus on the key locations like Yndaros and Thistle Hold. However, even a short document (in Swedish) like Rapport 22:01:08 can get creative juices flowing – and the map at the end, showing the greater expanse of the continent around Ambria, Alberetor and Davokar, got me thinking. What about the places that don’t get a mention? Like a picture, a map can provide a lot of potential with a minimum of content, even when the map has a lot of blank space. Once you have a map, you can start staking out the territory – and adding a bit of structure to the map helps that process. You might only need a little bit of help to create a lot of potential adventure. With a few simple tools, you can easily run a hex crawl in the region around Ambra. To do that, you will need to consider a few specifics about the environment and the local population – and perhaps strike a few sparks with something I’ve discussed before – Rory’s Story Cubes. The land to the west of Davokar does not invite exploration. Even before I started filling in the gaps, the ominous fortress of the Blood-Daughter underscored with the reference to the Saar-Kahn did not bode well. The landscape, while fertile, offers little cover from hostiles and the weather, both of which present great danger. However, the combination of danger and dark towers tends to be a magnet to adventuring types — and I would suggest you offer them other tantalising reasons to venture out in this direction. Roughly speaking, the average ride across the plains will cover 25 miles a day. That assumes fair conditions (which you certainly won’t find), without need for watchful riding (which you wouldn’t risk with the Saar-Kahn abroad) and no delays (which seems just as unlikely). 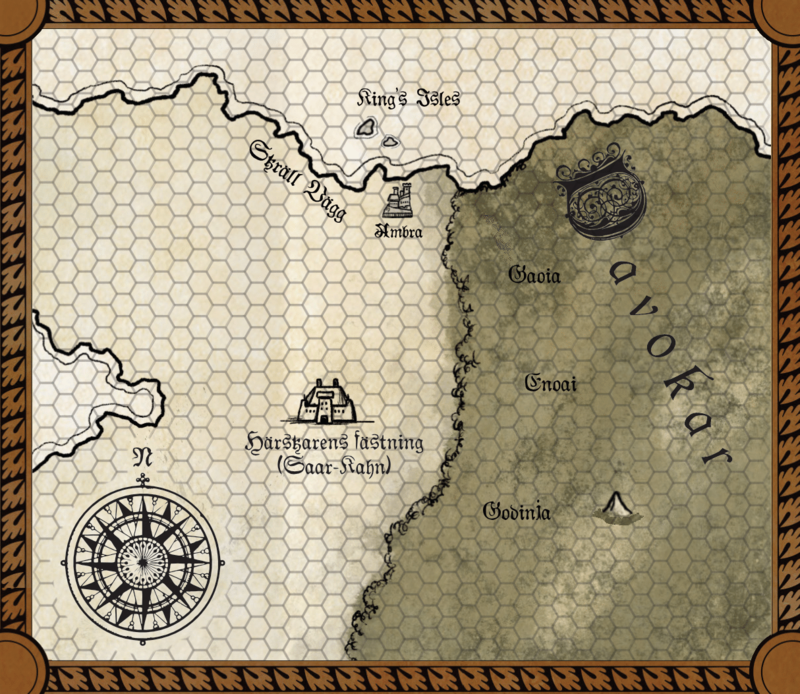 The hex overlay I used for the map fits a scale of roughly 50 miles per hex, which means that characters will spend two days crossing a hex on horseback and roughly four or five on foot. As I said, the landscape is not welcoming. For a radius of more than 100 miles around Ambra, the great storm writhes like a living entity, lashing out indiscriminately. Cold, hard rain batters the ground into an oblivion of ankle deep mud. For travellers, the upshot of this means standard travel has the downside of a Forced March without the benefits of distance, whether mounted or on foot – so, no natural healing anywhere within this zone. Attempting an actual Forced March counts as Death Marching; in turn, the conditions make an actual Death March impossible. As well as complicating travel, once outside the storm travellers need to have made preparations. You can read more about Rough Travel in Symbaroum and apply the principles here. Without support, player characters will need a good scattering of skills to secure food, shelter and reasonably safe passage. What’s out there in the rolling expanse of terrain, south-west of Ambra and surrounding the Härskarens Fästning, wherein lurks the Blood Daughter? A simple way to generate terrain is to use Rory’s Story Cubes and a draft print out of the map. In practice, you can assume that each of the hexes can contain a key encounter or location. That said, a 50-mile hex represents a huge amount of open space that will exhibit a considerable variation in territory. I suggest that you use the Story Cubes to generate major plot significant encounters and use a more simplistic method for everywhere else. A lot of this depends on your players and your plans for adventure. If you just want to move from Ambra to an adventure site, you can choose to narrate the journey rather than slog through every mire-riddled mile. On the other hand, if you calculate the distance and the travel time, you may want to have one key challenge per day – or use the character’s hirelings and preparation at a guide to their likely encounters (if they didn’t have a Porter, they might lose some of their supplies at a key point). For simple encounters, roll 1D6. Take 1-2 for mean a friendly, 3-4 for a neutral, and 5-6 something hostile. Odd number, a creature or individual(s). Even number, a location. So, a roll of 5 might mean an encounter with a pack of Gnarls, while a 2 could be a fortuitous meeting with a small Gaoian trade caravan. A roll of 4 might be an abandoned camp with a few forgotten supplies or a small grove of edible, if bitter, fruit. To a degree, how you determine each roll comes down to you and your instincts. If a dice misses the map altogether, opt for the one that stayed within the bounds – or roll again. If a die rolls into the sea, don’t discount it – it could be an island or, as with my map, the tallest spire of some ancient building poking above the surface of the waves. It could be a drowned volcanic isle or a case of oceanic dungenesis. If you use a plain die, take the same results outlined above and apply them to the spot – so, a 3 means a neutral creature, for example. I would recommend using another source of creative input if possible, to ease the burden. Try a site like Pinterest, Deviant Art or even just the Image search on Google. You could try a random article from a news site or perhaps a lucky dip on Blogger or WordPress. Alternatively pick a reference or gaming book off a shelf and open a page at random. Interpret what you see loosely – whether you’re using a Story Die or some random image off the Internet. If you get an article about an earthquake, the hex might contain a severely damage settlement, a travel-hindering chasm, or a ragged group of refugees seeking a new home. A picture of a celebrity at a movie premiere might represent crossing paths with a trader who has news of a local leader attracting attention with a show of force, doing something that draws unwanted attention, or a friendly meeting with someone willing to exchange supplies for information. While the die roll you can see spawned an actual maze, other rolls were more tangential. A result that showed a small figure with a large shadow turned into a possible encounter with a collosus, while a tree felt like a good spot for an outpost of the Iron Pact. Really there is no right or wrong way to do it, and certainly no need to do a lot of work upfront. 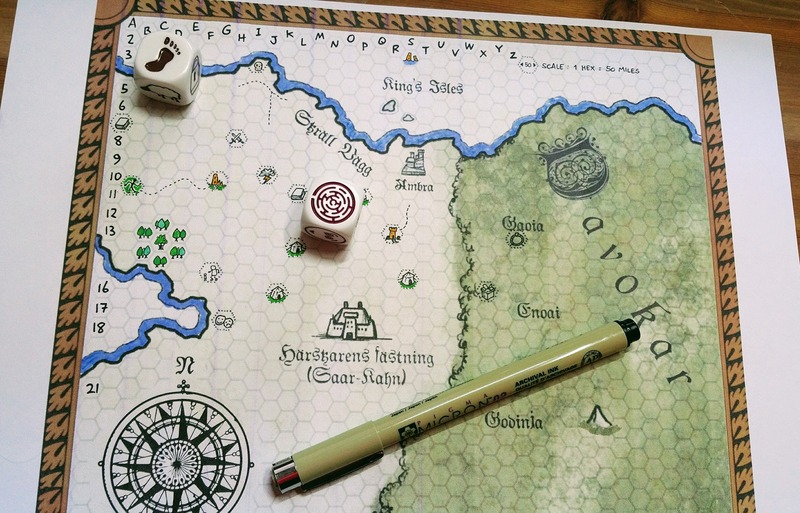 Consider making a dozen rolls to start with and see how that works out – and then add more as the adventures progress and the campaign shapes up. Support the Patreon campaign for The Iron Pact to fund the time and space for more Symbaroum articles, encounters, monsters and more. Post is part of the #AtoZChallenge.